The encoded text, published on the website of 4YEO, has not been solved by any of the more than 2400 registered competitors in the contest. They not even have approached. Some have sent us texts in English (when the code to reveal clearly included the letter "Ñ", and have even sent us texts in African languages. This shows that our code remains indecipherable. The text that hid the group of letters corresponds to the book BIOGRAFIA OF CORTE INGLES, of the writer Javier Cuartas, Editorial Libros Limite (1992) page 278, second paragraph, Líneas 1-23 inclusive, without punctuation. 4YEO is a company belonging to the LEGISDALIA GROUP (www.legisdalia.com) owned by DÍDAC SÁNCHEZ (www.didacsanchez.com). Our director learned three years ago about the existence of this encrypted message system and soon became a personal hobby to decipher it. 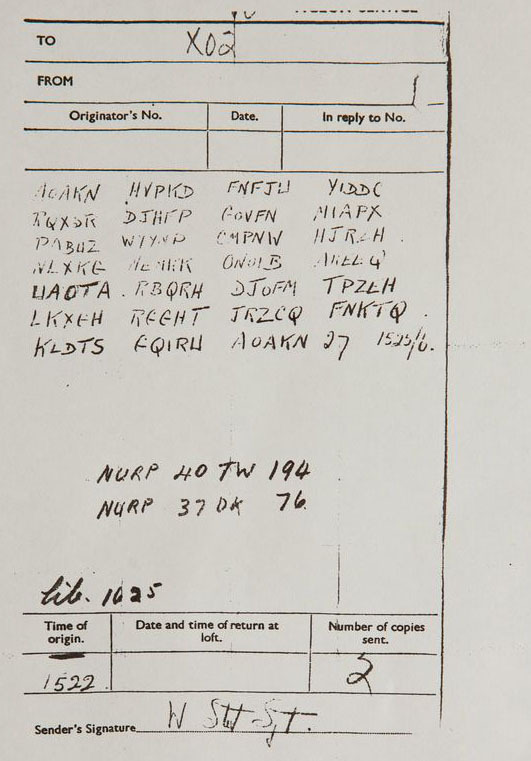 This encrypted message was found in 2012 in Surrey (England) when the owner of a country house, found on the chimney the skeleton of a dove carrying in his pocket, inside a metal tube, this message, corresponding apparently to the days before the attack of the Allied forces in Normandy, better known as the day "D". to date, even though thousands of people and several intelligence services have tried to find the encryption key utilized, none have succeeded. To this day…. After three years of depth study, DÍDAC SÁNCHEZ found the encryption system used for the message the pigeon carried. 4YE0 (acronym of for Your Eyes Only program) is developing a unique computer program to decipher the message content, now that we know how was encrypted. Although the system is foolproof, our team has a very sophisticated encryption process, achieving an improved version of it, which further hinders a possible resolution. Therefore, 4YE0 has been created, a program that allows you to encrypt any text without the possibility of it to be revealed. Only two persons (the sender and the recipient) involved in sending the message or text, can decipher it. The program will be released in late 2016 and will be applied to companies, emails, and mobile and internet applications (WhatsApp, Messenger, Skype, SMS etc ...). 4YEO is also creating a software for encrypting phone calls.